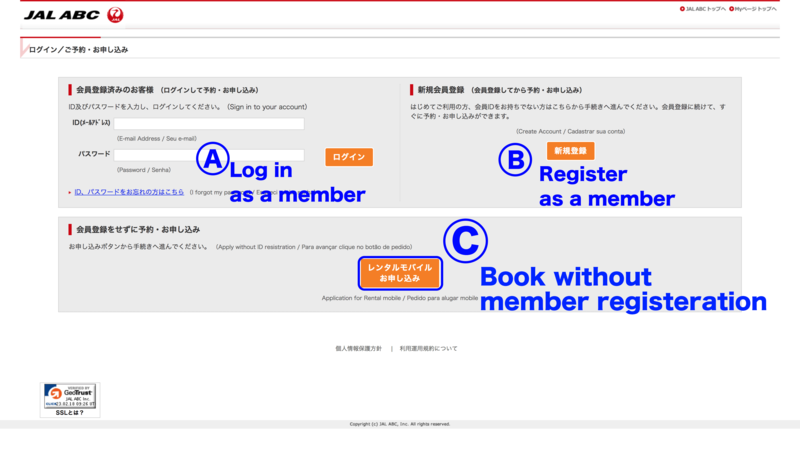 Some part of the JAL ABC booking pages are written in Japanese. So check out below before you proceed to booking page. 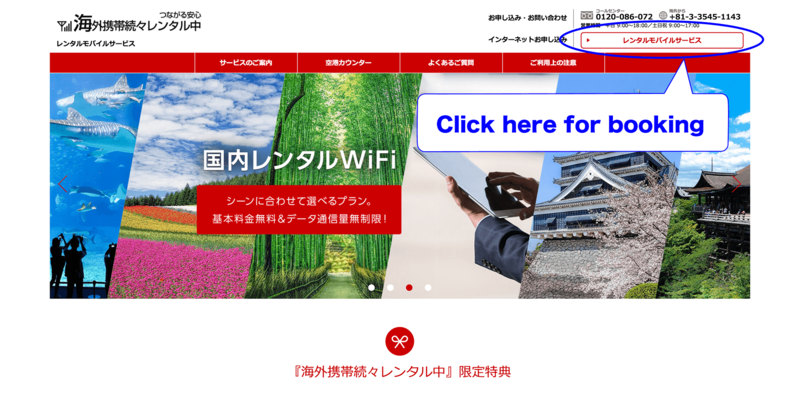 Here are 5 steps to book a reasonable pocket WiFi at JAL ABC. 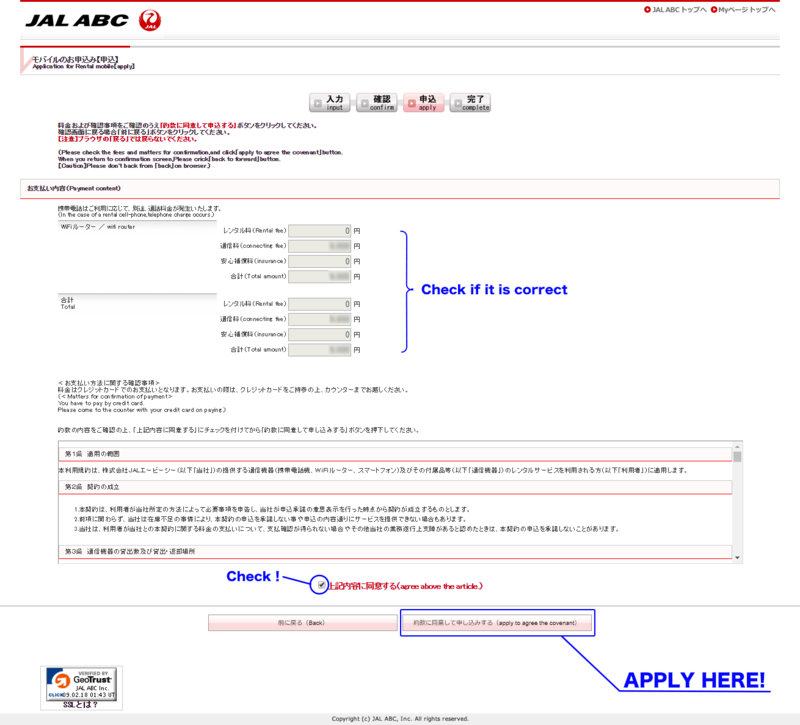 If you have your own account at JAL ABC or want to create it, proceed A or B. If you want book without ID registeration, proceed C. After this step, the explanation will be based on C.
A. Login as a JAL ABC member. C. Book now without registration of membership. Input your rental term, where to pick up, where to return. Choose "Customer using in Japan" at "Place to use" at the beginning. In "Country to use", you will choose "Asia" for area and "Japan" for country. 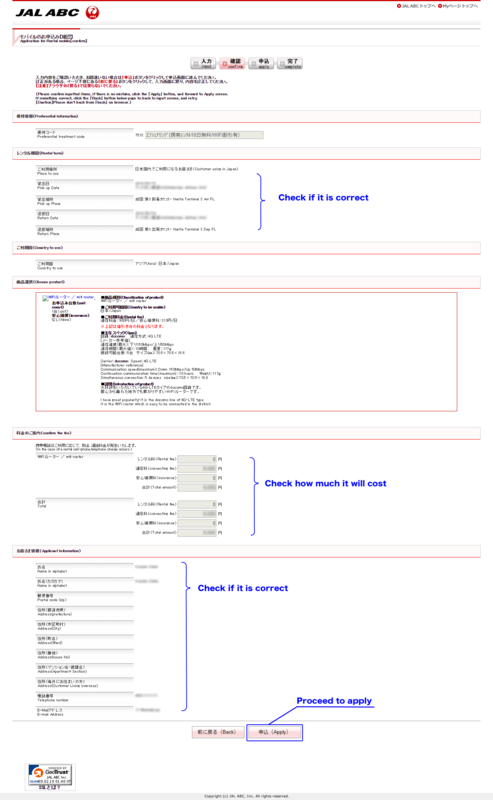 Confirmation - check here if everything you input is correct. Final confirmation and apply from the button at the bottom. By when do I have to book a pocket WiFi to receive at the airport? You need to apply 1day before your departure if you pick up at Narita(NRT) and 2days before at Haneda(HND), Chubu (NGO) and Kansai airport(KIX). What do I need for picking up a rental pocket WiFi? We request you your ID such as a passport and a credit card for deposit when picking up a rental pocket WiFi at JAL ABC counter. What if I cannot return the reatal pocket WiFi at JAL ABC counter? You can use delivery service for return. In that case, the day you ship the device will be the last day of your use. Please be noted that we need you to bare the shipping cost.